Collecting bugs can be difficult here in the southwest. We have to be a little ingenious and have devised this method of trapping them. It works especially well if hung at arms level at swapmeets. As you can see, it consists of a wire mesh cage with a one way door. We have used J-37's as shown here for bait, but J-38's or a classier straight key would likely bring in better results, maybe even a Melehan (though the cage would probably have to be built a bit bigger!) 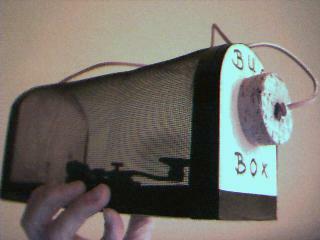 This "Bug Box" was actually designed by Ed Faulkner in Ohio, and he swears it has thus far captured a Postal Telegraph Test unit (1904 Skirrow Patent) as well as several other choice pieces! Here is the New Mexico Bug Box in action. All we're using for bait is the J-37, and so the prey turns out to be a J-51. You will get better results with better bait. Also, you need a bigger opening in the box to catch, say, a Vibroplex!